An important mid‐term election is right around the corner. This time around, New Jersey is a battleground state. We’ll be sending postcards to union members from key congressional districts around the state to remind them about the important issues, and urge them to the polls on November 6. Lunch will be provided, so we can stuff envelopes and stuff our faces all at the same time. Wednesday, 10/24 12 noon‐2pm, Knightsbridge: Room 135B, 33 Knightsbridge Rd. Open to stewards, building reps, activists, and democracy nerds — This activity will be successful if you come AND BRING YOUR CO‐WORKERS. Spread the word, bring a new member. This is not a candidate‐based activity. Open to members only. Membership forms available at the door. 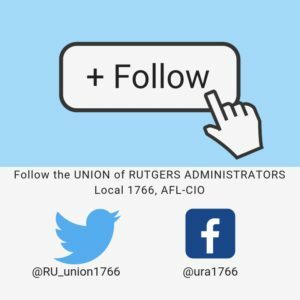 URA‐AFT #1766 is participating in the annual NJ State AFL‐CIO Labor Walks again this year. Members who participate will receive a stipend for each Labor Walk they participate in. Each member is encouraged to bring a relative/friend over 18 yrs old with them to participate and they will also receive a stipend. 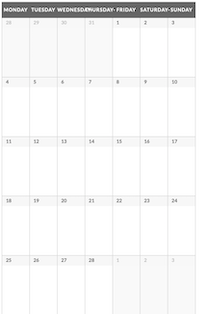 See the below schedule or download it here. Remember…the last day to register to vote in New Jersey is Tuesday, October 16th. Check to see if you are registered by going to https://nj.gov/state/elections/voting-information.html#vrf. Employees in legacy Rutgers positions shall not report to work unless otherwise instructed and are not required to charge credited leave time to receive compensation for the day. Employees in legacy Rutgers positions designated as Essential Services personnel, as defined in Policy 60.1.29, may be required to report for work on December 24, 2018 and remain at work that day as set forth in Policy 60.3.19. 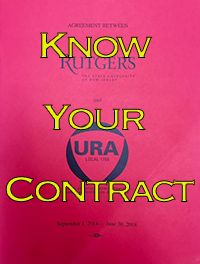 Keep in mind that this benefit for Rutgers staff was first negotiated by the URA‐AFT in 2007 and since then it has been extended by policy to others. This is one of the benefits of having a strong union and dedicated membership. October 15, 5:30 PM. Nominations take place at General Membership Meeting, Rm. 116 A, Busch Student Center. If you would like to verify that you are eligible for nomination or have questions, please read the URA‐AFT Constitution Article IV “Election of Officers”. If you still have questions please contact elections@ura-aft.org. Nominees: You must be a signed member in good standing. Remember to make every effort to be present (in‐person) at the nomination meeting on Monday, October 15, 2018; or accept nomination in writing and have acceptance document available at the October 15 meeting. Any eligible member may nominate him/herself or another eligible member. Please refer to URA‐AFT Constitution Article IV, Section III, items “d” and “e”. Not Running? Could you help out the day of the election at the polling locations? Please contact elections@ura-aft.org. At the October 15 Membership Meeting, we will also nominate candidates for 10 delegate seats who will represent URA at the AFT New Jersey (“AFTNJ”) Delegate Assembly. AFTNJ is our union’s state‐wide federation, uniting 30,000 members from PreK‐12 schools and higher education institutions across the state. AFTNJ delegates convene four times a year to manage the affairs of the organization, debate policy and promote educational excellence and access. Many of these meetings take place on the Rutgers‐New Brunswick campus. Each spring, AFTNJ hosts either a Legislative conference or the biennial Convention, or both. AFTNJ is our voice for legislative, policy and professional issues as they relate to administrative and professional staff in higher education.